January gave us some proper wintry weather, and the frosty mornings only gave us small harvesting windows each day. The leafy greens are getting harder to find now and the pigeons are becoming more of a problem, now there’s less for them to eat, all par for the course at this time of year though. 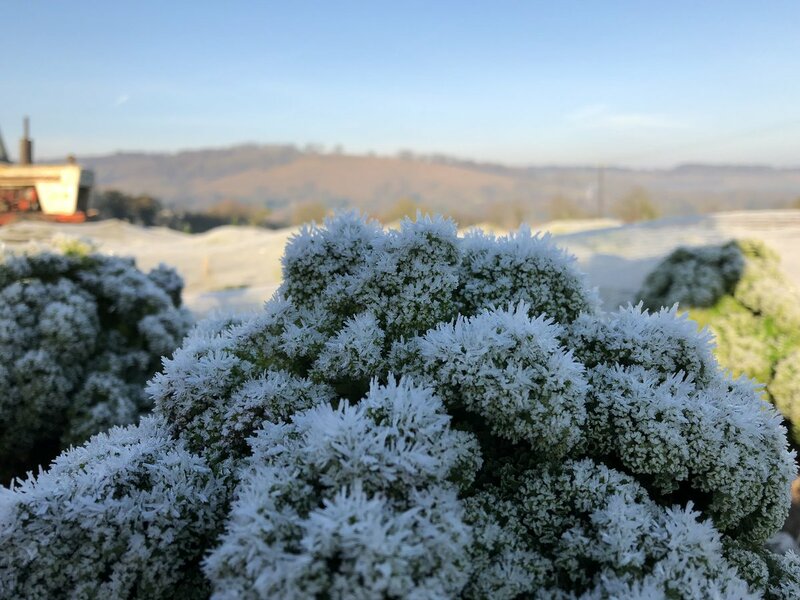 New Season’s growing – no new crops ready for a few months yet I’m afraid, but we have started sowing trays of seedlings, and spread some composted manure whilst the ground was frozen. Ripple’s Stir Fry Bags – as our leafy greens get less plentiful at this time of year, we often make up our stir-fry bags, they’re sort of the vegetable plants equivalent to ‘nose’ to tail’ eating! As anyone who’s grown their own knows, many brassicas send out delicious side shoots at this time of year, even cabbage stumps can yield a handful of mini-cabbage shoots, add to these a handful of flower sprouts (a kale/sprout cross), a leek that hasn’t grown to full size and a few other leaves and you have a bag full of green tasty treats, that take very little preparation and cooking (just wash well and cut up). Enjoy!